Hong Kong to Geneva drive? Owner and president Osvaldo Patrizzi Antiquorum expected from the July auction Important Collectors’ Wristwatches, Pocket Watches and Clocks in Hong Kong a lot. Encouraged by the number of registered users: about 6,000 people set out to compete for the right to have 406 lots. And I must say, expectations have been met. Was sold watches worth $ 6.081 million – almost three times smaller than the spring auction Geneva, but more than in New York and twice in the winter here – at the Ritz Carlton. But in contrast to Geneva, this time loud sensation has been submitted. As expected, most of all – $ 412 000 – paid for the Patek Philippe Minute Repeater Tourbillon, No. 1903061, case No. 2906878, Ref. 3939H. 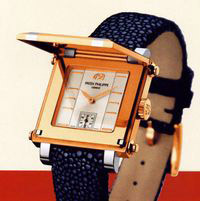 Minute repeater with tourbillon in a 34-millimeter case made of yellow gold was released in 2000 and belongs to the category of curiosities. 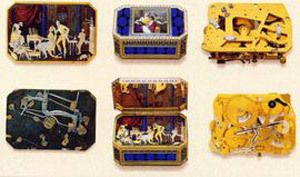 The oldest was a lot 373 – music box (87 x 60 x 35 mm) Antoine Rojard a Geneve, No. 2174. Her in 1810 created a master Jean-Georges Raymond (Jean-Georges Remond). Golden casing is decorated with pearls and emalevoy painting. Under the cover panel with automatons – the lady playing a musical instrument, it sets the rhythm of the monkey, the students corrected each other haircuts. Raymond was one of the most skilled craftsmen shkatulochnikov Geneva. Unfortunately, to this day lived just a few of his work. This is valuable because it is an autograph on the maestro. 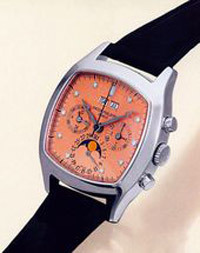 As a result, box went for $ 390 000.Third place ($ 190, 000) also got Patek Philippe, No. 3045226, and Ref. 5020P. This platinum chronograph tonneau case with perpetual calendar, moon phase indicator and diamond hour markers made only on orders from 1995 to 2001. Also of note is the steady rise in the cost of the German company Tourbillon A. Lange & Sohne. Thus, one of the 15 hours Tourbillon Pour le Merite, No. 107/150, Ref. 701,001in the case of white gold have been sold for $ 190 000. It is only 10 thousand less than was requested for the same hours, but in a platinum case, this spring. Not justify the hopes of a unique set of collection a dozen Rolex Oyster Perpetual Day-Date with different colored dials. More than $ 170,000 for the entire set no one offered. And finally, the most expensive pocket watch ($ 170 000) was the famous Tourbillon with three gold bridges, Girard-Perregaux.Noteworthy, these 62-millimeter gold watch that the tourbillon carriage for them created in 1907 by a famous artist Albert Pellaton-Favre. September 22 in Monaco under the auspices of a charity event held Antiquorum auction Only Watch 2005 in favor of the Monegasque Association against muscular dystrophy. To watch collectors it is of great interest, because the auction will be exhibited 34 models the most famous and prestigious companies. And it will be the prototypes and the first copies of hours of such famous lines as Audemars Piguet New Royal Oak, Breguet Marine 5817 PR, Frederique Constant Heart Beat Manufacture, Hublot Solo T Flying Tourbillon, IWC Ingenieur Automatic, Louis Vuitton Tambour Diving Automatic, Omega De Ville Rattrapante . An even bigger thrill is a list of unique models that will be put up for sale: Blancpain Leman Only Watch, Chopard Palladium LUC Quattro Regulator, Corum Golden Bridge Only Watch, De Bethune Platinum DB S 8-Day, DeWitt Tourbillon Differential Academia Espoir 2005, Eterna KonTiki GMT, Franck Muller Crazy Hours Monte Carlo, Harry Winston Excenter Biretro Starlight, Jaeger-LeCoultre Reverso Duetto, Panerai Radiomir GMT Platinum, Parmigiani Ionica, Patek Philippe Ref. 5099/101RG Cabriolet, Piaget Emperador Retrograde Seconds, Pierre Kunz Grande Date Monaco, Swatch Only One Watch, Vacheron Constantin The Malte Tourbillon Stainless Steel, and, finally, Zenith Grande ChronoMaster XXT Tourbillon.